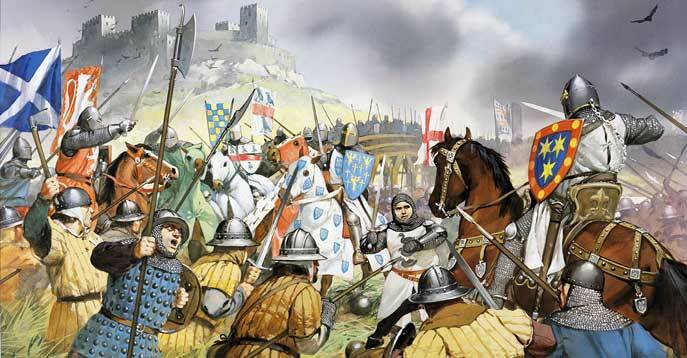 With many of his Barons hostile, Edward was desperately trying to raise an army to use against France. This situation left him with no troops to send north against the Scots. He therefore decided to release several of the Scottish nobles he had been keeping prisoner since Dunbar. Among them were Alexander Comyn and the Earl of Buchan, who were released on the condition that they quell the disturbances. When the nobles arrived north, they found the situation far worse then they had been told. They sent various letters to King Edward expressing their loyalty and hopes of success. In the meantime they actually did nothing and waited to see how matters turned out. They also made no effort to prevent their retainers from joining the rebels. Wallace and Moray had not been idle. By the end of August they had captured Inverness, Elgin, Banff, Aberdeen, Irvine, Fife and Dundee. The entire country of Scotland, north of the Firth of Forth, was in Scottish hands. Finally, the Earl of Surray, Edwards Viceroy in Scotland, decided he should do something. He was an elderly soldier who had learned over the years that hundreds of foot soldiers could be scattered by just a few mounted knights. He was convinced that with most of the Scottish nobility and therefore their knights either on the sidelines, in prison, or in the service of Edward, that he could wipe out the commoners of Wallace and Moray with ease. Gathering a large host of heavy horse and foot soldiers, he marched towards Sterling, which was they key to crossing the Forth, and therefore, the key to the North. 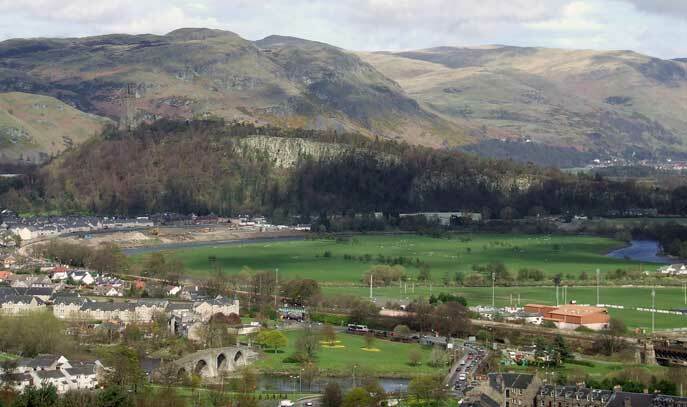 On hearing of this approach, Moray and Wallace joined forces and moved south to meet him and defend Stirling. Overlooking a loop in the Forth river, which was crossed only by a single bridge, was an abrupt rock called Abbey Craig, from which a small neck of ground led back to give safe retreat. Below the northern end of the bridge was an area of boggy ground almost entirely encircled by the forth. The Scots deployed their men upon the crag. The English were camped on the south side of the river. As no army of foot soldiers had ever prevailed against a large force of heavy cavalry, they were extremely self confident. James Stewart and the Earl of Lennox were hovering on the outskirts with a troop of cavalry, uncertain weather to join Moray and Wallace. They didn't feel the Scots had much of a chance and were hesitant to risk their force. In an effort to prevent the annihilation of the countrymen, they approached the Earl of Surrey with the suggestion that they initiate a parlay. The earl agreed but Wallace and Moray refused. Two Dominican friars were then dispatched to Moray and Wallace with offers of generous treatment if they would yield. "Tell your commander", Wallace replied, "that we are not here to make peace but to do battle to defend ourselves and liberate out kingdom. Let them come and we shall prove this in their very beards." At dawn on September 11, a party of English foot soldiers were sent over the narrow bridge but were recalled because the Earl had overslept. Hugh de Cressingham was fuming with impatience. He urged that no more time be wasted and the earl gave him the order to cross. He arrogantly led his cavalry across the bridge two by two. When approximately half of his force had crossed the bridge, Wallace and Moray gave the signal to attack. The main force of the Scots fell upon the leading ranks on the causeway that lead from the bridge to the more solid ground some distance from the bridge. A hand picked detachment seized the bridgehead and began to cut away its timbers. Jostled from the causeway, the heavy horses of the armored knights plunged into the deep mire on either side, unable to move or charge, throwing their riders to the ground. Behind them the rest of the English army was powerless to help as the bridge was now destroyed. A massacre now took place. Hugh de Cressingham was flayed and pieces of his skin were sent throughout the country as tokens of defiance. Legend has it that Wallace had a baldrick made from a large piece of it. The Earl of Surrey had not crossed the bridge, aghast at the carnage, he fled straight to the border. The foot soldiers and the baggage trains were not as fortunate. As they retreated, James Stewart and the Earl of Lennox, who were lurking in the woods on either side until they saw the outcome, fell upon the fleeing groups. 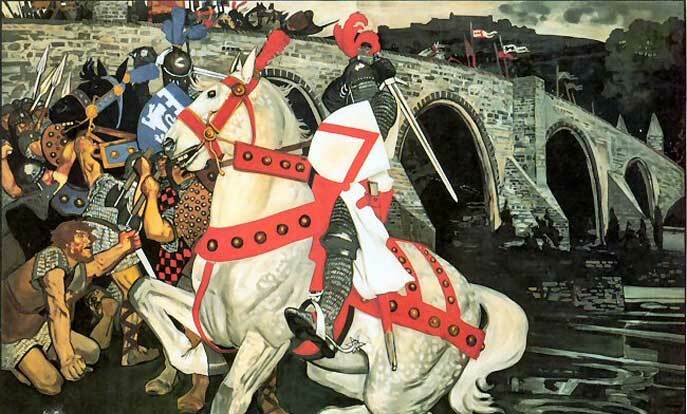 The effect was immediate, for the first time, commoners had defeated mounted knights. William Wallace had started as he meant to go on, and free Scotland from Englands grasping hands. Patriots are usually honoured by their countries, but Wallace is outstanding in this respect. Even before Mel Gibson's 'Braveheart' brought him to the attention of the rest of the world, Wallace was regarded as the greatest hero of all time in Scotland. Monuments and statues honour him all over the country, and 700 years after his death - his exploits are well known. His family motto was "Esperance" which means hope. Hope of freedom was his legacy - fulfilled 10 years after his death on the field of Bannockburn. William Wordsworth, the poet, wrote "Wallace fought for Scotland and left the name of Wallace to be found like wild flowers all over his dear country". Lord Roseberry, once Prime Minister of Great Britain, summed up Wallace's greatness thus" Without him the Scots might never have rallied for defence at all, Bruce might never have stood forth and Bannockburn might never have been fought. It is for that we honour him".